ISLAMABAD, Pakistan (CNN) -- Two suspects were arrested in connection with the bombing of a mosque that killed at least 51 people, Pakistani authorities said Saturday. 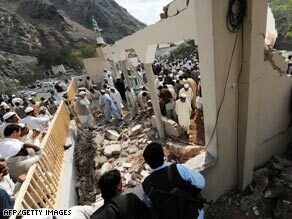 Friday's blast brought the roof of the mosque down on worshippers attending prayers. The two were arrested about 30 minutes after the Friday bombing after police spotted them fleeing the scene, said local official Rahat Gul. The suspects were being questioned about the deadly blast that also wounded more than 100 people. The blast occurred at Jamrod in northwest Pakistan, near the Afghanistan border. This is the latest assault in a region populated by Islamic militants in Pakistani safe havens along the Afghan border, where NATO and the U.S.-led coalition have been battling Taliban and al Qaeda militants. The bombed-out mosque had been frequented by Pakistani security officials who work at checkpoints along the route used by NATO to carry supplies from Pakistan into Afghanistan. The strike came hours before President Barack Obama explained his new urgent strategy for fighting Islamic militants in Afghanistan and Pakistan -- the latest in a long line of attacks in the region that have been staged on days of political importance in the volatile Afghan and Pakistani region. The two-story mosque had been packed with about 250 worshippers attending Friday prayers when the bomber, thought to be among the worshippers, detonated the explosive, authorities said. The building collapsed as the explosion rippled through the structure, and rescue crews deployed to the scene were searching through the rubble for more victims.